He picked up the gong in the Southern region of the National House Building Council's (NHBC) Pride in the Job Awards 2018. The achievement illustrates Bovis Homes' drive for build quality in its Northern Home Counties region. Dale said the award was “absolutely brilliant” for the team. “We're striving the best we can to make everything work on site,” he said. “It's all about the team, not just on the site but in the office too. It's put a smile on my face, it's absolutely brilliant. 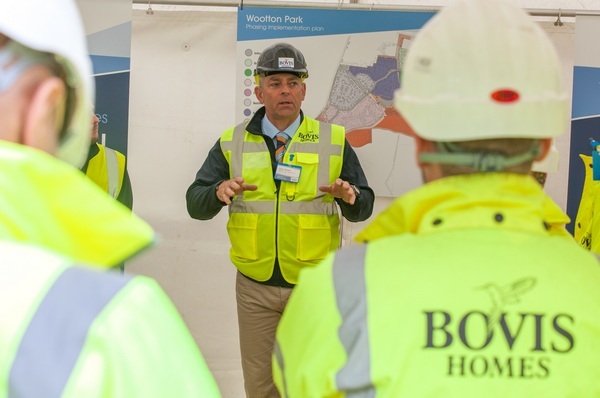 Michael Stirrop, managing director of Bovis Homes' Northern Home Counties region, said the company had received “fantastic feedback” from Wootton Park customers as a result of the team's efforts. He said: “This is a tremendous achievement for Dale and the whole Wootton team. This award shows exactly what Bovis Homes is about, pride in our work, and Wootton Park is a great example of it. Dale will now be entered for the Seal of Excellence and Regional Winner titles, the winners of which will be announced on 26 October.